Wine enthusiasts are familiar with �Layer Cake� wine, a mixture of many wines. We at Specialty Java Inc. were inspired by Jayson Woodbridge's (Woodbridge Winery) quest to craft wines that are stunningly good, yet very affordable; exquisite wines that can be enjoyed every day. In the wine world, the name �Layer Cake� is a symbol of something handmade with care. Jayson's grandfather told him wine was like his grandmother's delicious layer cake. Layers of chocolate, mocha, dark berry fruit and spices, just like grandmother's layer cake. 'Never pass up a good Layer Cake,' his grandfather would say. You can experience one of THE most complex cups of gourmet specialty coffee. 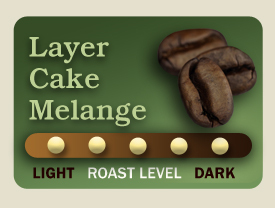 Our Layer Cake M�lange is created by, mixing many (sometimes 10 - 15+) single origin Arabica coffee beans together, to create a truly one-of-a-kind blend. In our micro coffee roastery we produce extra coffee for each and every batch of our roast-on-order gourmet specialty coffees. The reason is we need to have sufficient quantity of fresh roasted coffee to fill all the bags for each day�s orders. We discovered, when mixing all these different coffees together, the resulting mosaic was a stunning, complex, rich cup of coffee. �Layer Cake M�lange� was born! We collect these excess coffee beans, then create and release batches of �Layer Cake M�lange� regularly. The vast majority of each batch will be organicially grown coffees. Since it may not always be 100% we don't apply a USDA Certified Organic label to be compliant with our Certified Organic requirements. Each new batch will be a unique experience of Layer Cake M�lange.